The 60 acres of park-like grounds at Rosemont make the setting of this historic estate one of the most beautiful in Virginia. Local limestone fences and wrought-iron gates surround the entrance. 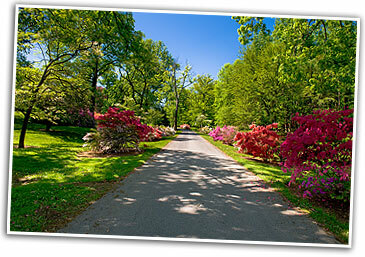 The drive leading to the manor rises gracefully through a grove of huge oaks and poplars landscaped with an abundance of azaleas, dogwoods, cherry trees and other ornamental plantings. Prized specimens of naturalized rare trees, planted by both the Tyson and the Byrd families, abound throughout the property, lining the driveway and dominating the landscape on the ridges and broad fields. A tour of the grounds provides a vast array of colors and shapes from all over the world. Hinoki cypress, katsura, Sophora (Scholar Tree), amur cork, kwanzan cherry, European hornbeam, and Lebanon cedar are just a few of the foreign species, as well as prize-sized domestic specimens of blue atlas cedar, weeping cherry, black walnut, box elder, sweet gum, red elm, hackberry, hophornbeam, copper beech, silver linden, locust, ginkgo, Kentucky coffee, and several varieties of maples, oaks and cherries, to just name a few! Senator Byrd Sr. spent over $100,000 in the 1930s and 1940s to have many of these rare and beautiful trees brought to Rosemont. The property is bordered by expansive apple orchards for which the area is well known, and many of which are still owned by Byrd family. The expansive and breathtaking grounds at Rosemont have hosted many beautiful outdoor wedding ceremonies and receptions, as well as providing endless opportunity for exploration and enjoyment by our overnight guests. To find out more about having Rosemont host your wedding celebration or B&B getaway, please give us a call at 703-879-5683. Make Rosemont a part of your history today.